Atwater Kent, The Historical Society of Pennsylvania Collection. Conjure an image of early America, and Federal-era architecture, bustling shipyards and streets, and bucolic farm scenes probably come to mind. Whether most of us realize it or not, much of how we view that era was created by William Birch (1755-1834), a London transplant whose work became synonymous with the time when a young nation was full of hope and optimism. Museum of Art. Gift of the McNeil Americana Collection. Now through October 5, the Library Company of Philadelphia is showcasing Birch’s paintings, including never-displayed manuscripts, enamels, and other pieces illustrating Philadelphia during the nineteenth century when it was the capital of America. 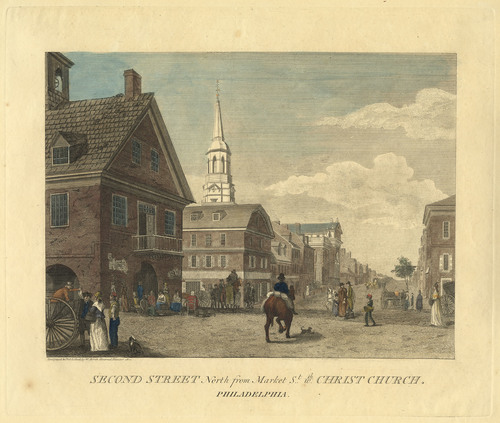 William Birch, Second Street North from Market St. w[i]th Christ Church, (Philadelphia, W. Birch),1827-1828. Hand-colored engraving. Library Company of Philadelphia. Meanwhile, Birch’s follow-up book, Country Seats, was less successful. “The views in Birch’s Country Seats are much smaller in size and appear rather lifeless,” explained Weatherwax. “Nor is there a built-in audience for scenes of a wealthy gentleman’s country estate in the same way that views of city’s street life would have. Also, Americans of the period tended to think of the countryside as the location for agricultural endeavors or other practical uses, not the rural retreats Birch portrayed.” Though Country Seats met a tepid response, Birch knew his work held importance beyond what his contemporaries thought. In his autobiography, Birch wrote that his book was “the only work of its kind yet published.” Little could he have realized the historical record his achievements would provide over two hundred years later. Birch is considered to be one of the first commercially successful artists in America, and his work remains as relevant as ever, even if the places he painted are drastically changed. “Birch’s views of Philadelphia provide us with our most comprehensive documentation of an 18th century American city and continue to be the cornerstone of how we represent a late 18th century urban space,” said Weatherwax. 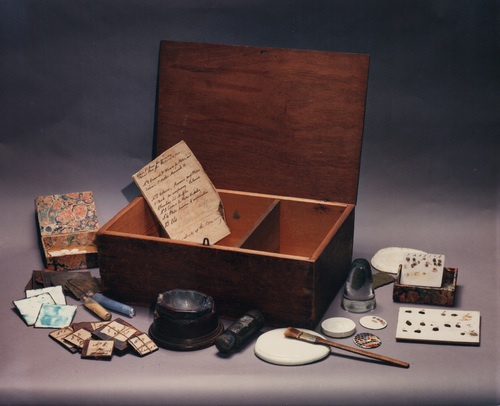 Approximately 100 items from the Library Company of Philadelphia’s collection are on display, including material loaned from other institutions and private collectors. Highlights include Birch’s private copy of the Country Seats with a notation stating, “intended to be continued but no encouragement,” two ceramic vases made by the Tucker Factory of Philadelphia decorated with views from Birch’s Country Seats, a watercolor sketch of Birch’s country estate, and a copper engraving plate used for City of Philadelphia. Now through October 5, the Library Company of Philadelphia is showcasing Birch's paintings, including never-displayed manuscripts, enamels, and other pieces illustrating Philadelphia during the nineteenth century when it was the capital of America. "The exhibition tells the story of Birch's entire life from his early years in England to his death in Philadelphia," explained the Library Company's prints and photographs curator Sarah J. Weatherwax. "It also explores the influence Birch's work had on Philadelphia iconography long after his death. While many people are aware of Birch's views of Philadelphia, few know much about his work as an enamel painter or his aspiration of being a landscape architect, themes that are examined in the exhibition." Considered America's first "coffee table book," Birch's now-iconic The City of Philadelphia (1800) showed a civilized city and helped bolster early national pride. It was also a commercial success. "The City of Philadelphia showed Philadelphia as the cultural, economic, and political capital of the newly formed United States," Weatherwax said. "Here, between the Schuylkill and Delaware Rivers was a city where important institutions flourished, where businesses prospered, and where the inhabitants carried out their activities of daily lives. The engravings are large, colorful (if you paid to have them hand-colored), and engaging." Meanwhile, Birch's follow-up book, Country Seats, was less successful. "The views in Birch's Country Seats are much smaller in size and appear rather lifeless," explained Weatherwax. "Nor is there a built-in audience for scenes of a wealthy gentleman's country estate in the same way that views of city's street life would have. Also, Americans of the period tended to think of the countryside as the location for agricultural endeavors or other practical uses, not the rural retreats Birch portrayed." Though Country Seats met a tepid response, Birch knew his work held importance beyond what his contemporaries thought. In his autobiography, Birch wrote that his book was "the only work of its kind yet published." Little could he have realized the historical record his achievements would provide over two hundred years later. Birch is considered to be one of the first commercially successful artists in America, and his work remains as relevant as ever, even if the places he painted are drastically changed. "Birch's views of Philadelphia provide us with our most comprehensive documentation of an 18th century American city and continue to be the cornerstone of how we represent a late 18th century urban space," said Weatherwax. Approximately 100 items from the Library Company of Philadelphia's collection are on display, including material loaned from other institutions and private collectors. Highlights include Birch's private copy of the Country Seats with a notation stating, "intended to be continued but no encouragement," two ceramic vases made by the Tucker Factory of Philadelphia decorated with views from Birch's Country Seats, a watercolor sketch of Birch's country estate, and a copper engraving plate used for City of Philadelphia. 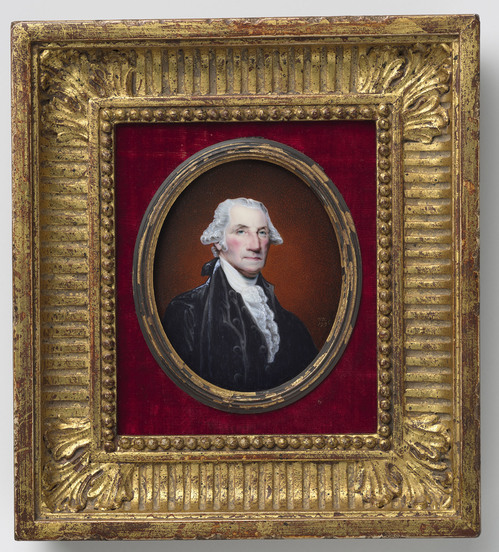 The Library Company's director Michael Barsanti likened Birch's portraits to America's baby pictures, and that "they show the strength and promise of our country as it appeared in its earliest days. They also show what we looked like through the eyes of a new immigrant, who saw a contrast between its vitality and undeveloped natural beauty and the England he left behind."